Has yawning become a part of your daily routine? Do you feel like you didn’t sleep? It’s time for you to feel rested. Instead of grabbing that extra cup of coffee, goahead and make a change to your sleep regimen. Even if you have a busy lifestyle, you owe it to yourself to sleep better. Obstructive Sleep Apnea (OSA) occurs when the tongue and soft palate collapse on the back of the throat, blocking air flow into the lungs.Lacking oxygen, the brain awakens the sleeping person to breathe (up to 300 times per night), depriving the person of essential REM sleep and causing a list of problems associated with chronic lack of sleep. There is over 15 years of evidence supporting the effectiveness of oral appliances. 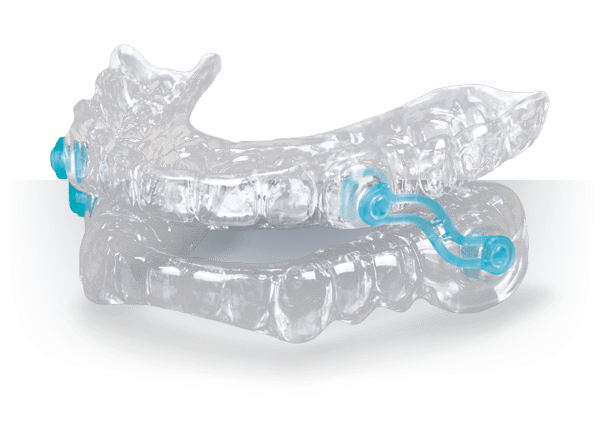 This specifically designed “mouthpiece” fits over your teeth and is custom-made for you by our licensed dentists who have advanced training in dental sleep medicine. Our custom designed orthotic device gently realigns the tongue and jaw to assure an open airway and allow normal air flow to the lungs as you sleep. Treatment is simple and can be completed in a few appointments!